PAR's midtown office is located on the site of a small Craftsman house built in the 1910s. When the house burned down in the early 1990s PAR's owners purchased the lot and worked with architects to design an office facility that would accommodate PAR's growing staff and reflect the historic flavor of the Poverty Ridge neighborhood. The decorative knee braces, scuppers, multi-pane windows and balcony are elements drawn from historic buildings in the neighborhood, as are the use of wood doors, low wrought iron fencing and bay windows. The care that went into the design and construction of the facility drew attention from City of Sacramento preservationists and the design review committee. In 1994, the newly-completed structure received an architectural achievement award from the Sacramento Old City Association in the category of best New Commercial architecture. 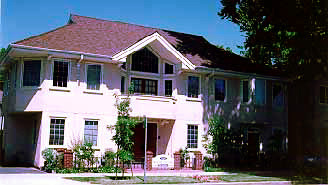 The award noted that 1906 21st Street was "a structure of unique architectural significance which compliments and enhances the visual quality of Sacramento's Old City."